For many emotional eaters, the holiday season’s over indulgences begin with Halloween. The sheer volume of candy and delectable treats lining supermarket and drugstore shelves and home pantries is in itself downright spooky! And to add insult to injury, candy is being handed out everywhere you turn. Candy manufacturers seem to be oblivious to the obesity epidemic as they dream up new ways to combine sugar, fat and salt into small, miniature packets of ecstasy. 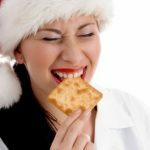 For those with food sensitivities or prone to food addiction, it can take a herculean effort at this time of year to resist the pull of favorite treats that elevate brain chemicals and conger up blissful childhood memories. 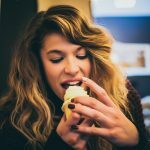 Unfortunately, dreaded weight gain and unpleasant dental visits aren’t enough to combat the powerful pull of these drug-like edibles. Tip #2. Stick to unprocessed, whole plant foods for the first few days after Halloween. Unprocessed plant foods, like fruits, green veggies, beans and lentils, are full of fiber and other important nutrients and will help cleanse and re-balance your system. Complex carbohydrates like yams and brown rice and simple sugars found in fruits will help satisfy any lingering cravings for sugar and starch. See if you can continue to add unprocessed, whole plant foods to your eating plan throughout the year–crowding out the foods that no longer serve your body and leaning into wholesome food choices. Tip #5. Plan some time for nourishing self-care activities. With the holidays fast approaching and stress beginning to build, it’s even more important to practice taking care of yourself now in non-food ways. Check in with yourself when you want to grab candy or unhealthy processed foods–if you’re experiencing unpleasant emotions like anxiety or frustration, remind yourself that indulging won’t resolve these feeling states. See if you can identify your true, non-food needs. Try soothing and comforting yourself by practicing deep-breathing exercises and writing loving, supportive, hopeful phrases and affirmations in your journal. 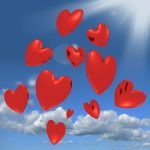 Take a bubble bath, or read your favorite uplifting spiritual passages. 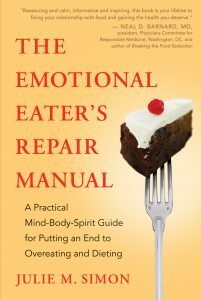 Rather than allow Halloween to hang over and mark the start of an eight week spiral downward into serious emotional eating, nip it in the bud early this year. Then applaud yourself for being willing to care for yourself in non-food ways this coming holiday season. 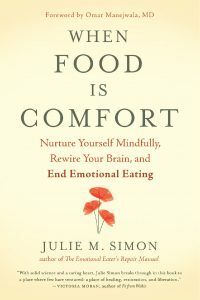 Posted by Julie M. Simon, MA, MBA, MFT., psychotherapist, life coach, certified personal trainer, speaker , founder of The 12 Week Emotional Eating Recovery Coaching Program and author of The Emotional Eater’s Repair Manual and When Food Is Comfort. 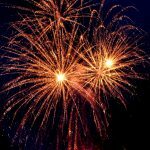 If you have a question or topic you would like to see addressed in this blog, go to https: //www.overeatingrecovery.com.